Of course he did it, says my father. Of course he lied. I have stopped looking for the reasons for all of these things that make no sense, but my father says I don’t have to look in this case, because it’s obvious. He did it to sap your energy; he did it to divert your attention. A whole lot of other things that didn’t quite make sense before suddenly snap into focus. The Cleaning Lady goes about her work in a companionable, quiet house. I made some cookies the day before The Cleaning Lady came. I made them mostly because I had a refrigerator full of limes … and yes, there’s a reason I had all those limes. I was supposed to bring punch to large event, and found a recipe in a cookbook for Blackberry Lime Punch. This sounded great except that it was very labor intensive and after I’d spent a half hour laboriously juicing blackberries, I noticed that the recipe made only eight glasses of punch – while I was trying to fill the punch cups of fifty people or more. So I went with Plan B, courtesy of Bettycrocker.com, which worked out well, if unexceptional – but afterward, found myself with a refrigerator full of limes. A little bit of hunting through cookbooks turned up a recipe for Coconut-Lime Bars from Mark Bittman’s How to Cook Everything Vegetarian . 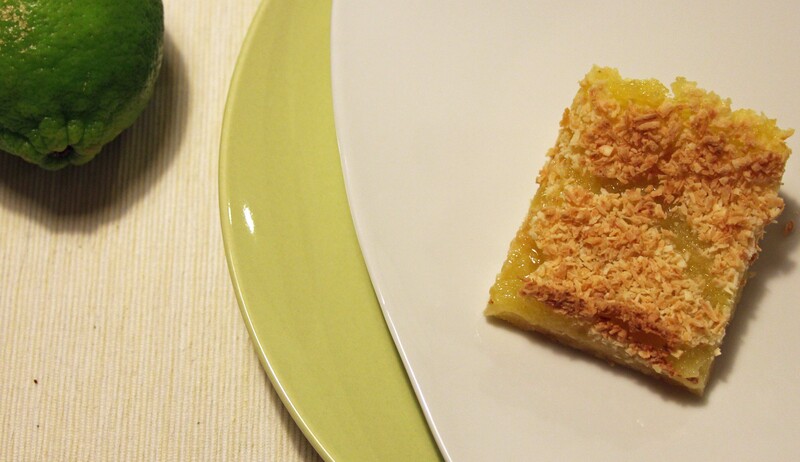 I love limes and these are basically updated lemon bars, only the nice creamy-tart layer is now lime with a nice crunchy topping of coconut. It seemed like a little bit of heaven to me, but The Child thought otherwise. Fine. I’ll start my diet next week, then. I offer a cookie to The Cleaning Lady, and we eat some together, standing in the kitchen. She pronounces them delicious. Coconut is one of her favorite things, she says. 1 stick unsalted butter, softened, plus a little for greasing the pan. Preheat the oven to 350* F. Grease an 8- or 9-inch square baking pan. Use an electric mixer to cream the butter with ¼ cup of the sugar and the salt. Stir in 1 cup of the flour and the zest. This mixture will be dry; press it into the greased pan and bake for 20 minutes, no longer; it should just be turning golden. Remove from the oven and cool slightly. Beat together the eggs, lime juice, and remaining 1½ cups sugar until lightened and thick. Mix in the remaining 3 tablespoons flour and the baking soda. Pour over the crust, sprinkle with the coconut, and bake until firm on the edges but still a little soft and jiggly in the middle, 25 to 30 minutes. Cool completely before cutting into squares. Serve immediately or store, covered and refrigerated, for up to 2 days. I hope he wrecked his car, says The Child. I hope he goes to jail. Don’t wish bad things, I tell her. When you send bad wishes into the world, they come back to you. Wish him his karma, I tell her. Wish that he gets what he deserves. Everyone does in the end, anyway. She thinks this is a good plan, and makes her wishes. We move on to other, more important things: she needs to bring snack to school for one of her classes. We are short on time (I just found out, she says. Tomorrow I need …). I dig through the cookbook shelf and find a book of the very easiest kind of cookies. Bar Cookies A to Z is no longer in print, though you can still get used copies on Amazon. It’s a fun little book and I’ve never had a bad cookie from it. Instead of bar cookies, says The Child, we’ll make Behind Bar Cookies. The cookie we chose was White & Bittersweet Chocolate Chunk Bars, which I thought was just your basic Toll House bar cookie only with white chocolate. It isn’t. Half the white chocolate is melted, so the cookie tastes more like a white chocolate brownie; also, there is no baking powder or soda so the cookie base remains fairly dense. 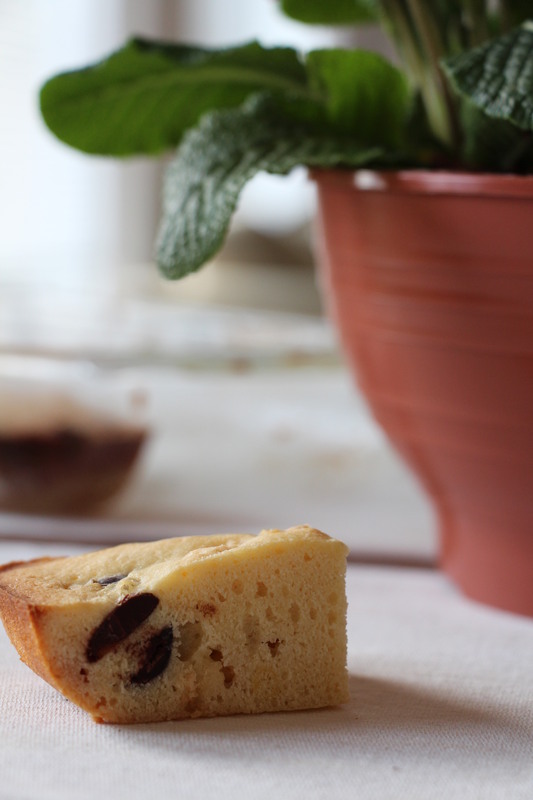 The original recipe calls for raisins, which we omitted on the basis that raisins just don’t belong in chocolate chip anything. We’re pretty sure there’s a law about that and we’re law-abiding types. We omitted the nuts as well because we were unsure if any classmates had nut allergies. I felt the final cookie would have benefited from the added texture of the nuts; The Child thought they were perfect the way they were. Preheat oven to 350 degrees. Butter a 9-inch square pan. Heat the butter in a saucepan over low heat until melted. Remove from heat and add half the white chocolate; do not stir. Set aside. In a large bowl, beat the eggs with an electric mixer until frothy. Gradually add sugar and beat until the mixture is light, about 3 minutes. Add the melted butter and white chocolate mixture along with the flour; stir to blend. Mix in remaining white chocolate and dark chocolate. Spread batter into prepared pan. Bake about 30 minutes, until the edges start to pull away from the pan. Cool at least 3 hours before cutting. Valentine’s Day rolls around, and no surprise – I don’t even really notice. Valentine’s Day, in my universe, consists of me buying things for other people, or rationalizing why it’s a made-up holiday – a Hallmark holiday – thus justifying for someone else why there will be no dinner, no flowers, no whatever. Except of course if you think about it, every holiday really is made up in some way, and that fact doesn’t make Christmas gifts any less appreciated. For The Child, though, it’s different. She’s still in school, and although her classmates are no longer exchanging Spongebob Valentines, they still do things. She still wants to do things for everyone in her class – meaning her grade level. Which means she has 36 Valentine things to produce. We decide on heart-shaped cookies, and go to the store and buy a heart-shaped cutter and some gift bags. I have an old recipe that I’ve never made, that was passed by my great-great Aunt Hattie to my great-Aunt Kate and from her to me, with promises that it was the best sugar cookie recipe I’d ever make. I’ve been meaning to make those cookies for ages. Both my Aunts have passed and I think of them often and with love, and probably for that reason no occasion has seemed special enough to try out those cookies. But we needed a sugar cookie recipe to make heart-shaped cookies, so I decided we’d try Aunt Hattie’s recipe. I had visions of us rolling out the dough and cutting heart shapes, but when we got home with our new cookie cutter and actually looked at the recipe, it turned out it wasn’t that kind of cookie at all. Roll it into balls, read the instructions, then roll the balls in sugar. Since by now I had my heart set on finally making these cookies, The Child and I agreed not to lay aside the recipe, but instead, to lay aside the new cookie cutter. 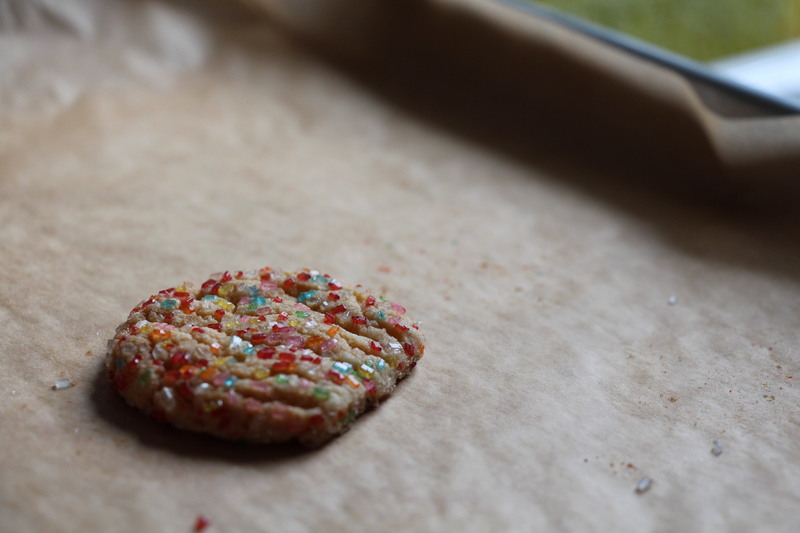 I mixed the dough, and she rolled the little balls in coarse confetti-colored sugar. They were wonderful straight out of the oven – sweet and chewy and mellow from the corn syrup, with a pleasing bit of crunch from the sugar. They looked pretty in the little cellophane gift bags tied with a red ribbon, all by themselves. And though most of them were gone – distributed quickly to classmates, there were a few leftovers for me to enjoy on Valentine’s Day. Mix dry ingredients and set aside. Mix remaining ingredients until blended. Add dry ingredients. Roll pieces of dough into balls about the size of a cherry. Roll the balls of dough in sugar. Bake cookies for 8-10 minutes, cool on racks.